VA Health Care Systems organize “Stand Downs” to bring VA services to homeless veterans in the community. Stand downs are typically one to three day events providing services to homeless veterans such as food, shelter, clothing, health screenings, VA & Social Security benefits counseling, and referrals to a variety of other necessary services, such as housing, employment and substance abuse treatment. 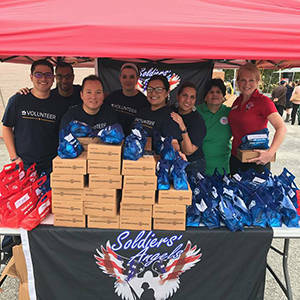 VA staff bring medical and dental expertise to Stand Downs and Soldiers’ Angels brings meals, hygiene items and other requested items to provide support to these veterans and help encourage veteran participation.